If you own a business you work your tail off. We understand. We do too. You do it for many reasons including pride, satisfaction, loyalty to employees and your own income. But you probably have another goal to. Someday you'll sell your business. That potential liquidity event requires strategic positioning well in advance, and our free eBook talks about one of the rarely discussed factors that can dramatically impact your valuation. Someday you'll be ready to hand off the hassles. Will you be ready? International diversification is an important consideration for small & medium size business owners. The bottom line? It's not a neutral factor. 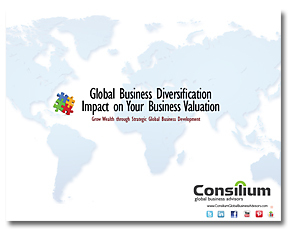 Diversify your revenues and your valuation will be enhanced. Ignore the business imperative and you'll likely face a 'distressed' multiple.